Like gold, silver is part of the precious metals asset class, and can act as a hedge against inflation and a portfolio diversification technique to mitigate geopolitical, monetary and systemic risks. Like gold, silver is a store of value and has retained its purchasing power over long periods of time. Recent studies have shown how silver is one of the only asset classes with a negative correlation to other asset classes, such as stocks and government bonds, making it the perfect investment for uncertain times. Silver is known to be an inflation hedge and this reputation is well-earned. Since inflation means a decrease in the value of paper money, unbacked by metal, when inflation rears its ugly head, smart investors turn to assets like silver, which has proven itself valuable throughout history. Because recent studies show that silver is one of the only asset classes that positively correlates with inflation, this is further evidence that investing in silver is a good way to protect your assets not only in times of economic turmoil but also against the ever-present long term threat of inflation. Silver is more affordable than gold, and investors in silver can accumulate more silver than gold, dollar for dollar. Psychologically, this makes the purchase of silver more achievable for small investors, seeing as $1,000 can buy up to 50 ounces of silver but not even one ounce of gold. The silver price is historically more mobile than the gold price, in that it can move more rapidly. So during the coming economic collapse, gold prices are expected to rise, but silver prices are expected to rise even more. During the economic crisis of the 1970’s, the price of silver rose 3,800%, compared to 2,500% for gold. Investors worried about government confiscation of gold, which happened in the 1930s, do not need to worry as much about the confiscation silver, since there is no historical precedent for silver confiscation. Silver offers the opportunity to move into true money, an actual store of value, with the potential for substantial gains in future years as its current cycle continues. Silver allows investors to protect themselves and their family by acquiring something with intrinsic value and insulate themselves from the destructive policies of central bankers. Most economic experts now agree that it is not a question of if, but when the next brutal economic crisis will hit. History shows us that those who come out on top after a recession are investors in precious metals, such as silver. 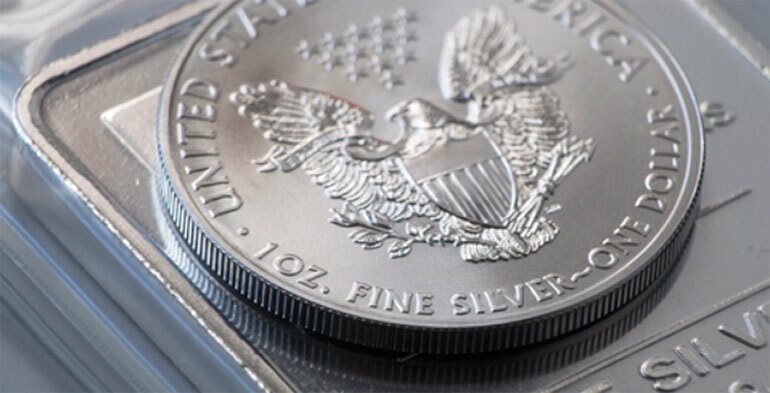 When the inevitable coming economic collapse happens, investing in physical silver will not only protect your wealth but allow it to appreciate significantly. Like an insurance policy, when fire strikes, the benefits outweigh the cost. At the current silver price level, the cost of insurance is tremendously cheap in relation to the wealth it would conserve when history repeats itself. Unlike gold, silver has hundreds of industrial and medical applications and its use is on the rise. Silver’s molecular arrangement and chemical properties make distinctly unique among earth’s elements. In the last two decades alone, usage has increased substantially to include an array of electronic and digital products, medical appliances due to its anti-microbial properties, and even clothing. High-demand consumer products such as cellphones, cameras, laptops, mirrors, and monitors all contain trace amounts of silver. This silver is never replenished or returned to stockpiles. As our information age progresses and silver’s chemical uniqueness is more fully understood, demand for this irreplaceable metal will only continue to rise. The majority of the world’s silver comes from nations marked with political turmoil, labor unrest, and undeveloped economies. Mexico and Peru account for the largest share of production, both of which have fragile political systems and primitive infrastructure. Geopolitical instability and poor infrastructure in turn significantly strains silver supplies, predicting a dramatic price increase in coming years. While this important ratio has historically oscillated throughout the last 2000 years, it has always reverted back to its historical average of 12 to 1. The current gold to silver ratio is hovering around 72 to one. Consider the tremendous upside potential for a silver investor purchasing silver with the ratio at these levels. The current incredible affordability of silver makes it one of the most undervalued assets in recent memory. One of the easiest ways to get started protecting your future is with a precious metals IRA. At Noble Gold, expert advisers will walk you through the entire process step by step. Visit their website to get your free Gold Investors Guide and learn more about the benefits of investing with precious metals.